In this video, Fab records a trio in live conditions. The main challenge here is to anticipate and manage the bleed from all the instruments into all the microphones, get the best possible sound and capture the live energy and emotion of the band. This tutorial will show you how to make fast decision, make compromises and how to get a good sound with what you have, along with basic recording concepts of guitar, vocals, drums and cello instruments. The microphones used are Josephson microphones. This session involves a lot of swapping microphones around as Fab discovers their respective best uses for each instrument. Preamps used: Dave Hill Europa 1, Tube-Tech MP1A, Neve 1073, Realios A9031. All recorded in Pro Tools. The song is called "The ship and the storm" by Will Knox. 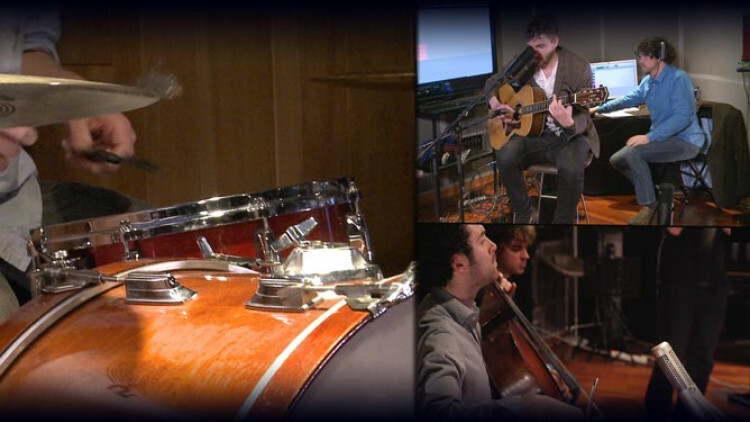 Will plays the guitar and sings, Simon plays the Cello and Thomas Pirot the drums. The musicians' feelings are here, the quality of the instruments shines through and the mood is perfect for the song. Everything is done in real-time. We only had two hours to set it all up, so it may be a bit experimental at times. This event is brought to you by 3 companies: Avid Puremix... Don't laugh at my accent! 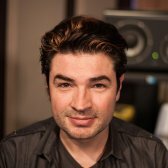 Avid, Puremix and Audio Addict Our engineer today is Ben Lindell who just arrived from New York especially for the occasion. So we're going to end up with a wonderful mixture of "Frenglish" -- great! The band that's playing tonight is Will Knox, from England, with whom I work in New York. On the cello, we have Simon who's also English. And on the drums, we have Thomas, who is French. So we have: one who doesn't speak French, two who speak a bit of French, and one who speaks French... and English. Should be fine. So, the first thing I'm gonna do is to describe the system that I'm going use for the recording. The idea of this seminar is to demystify the recording phase and find out how to work with tools that are available to us but not necessarily in a traditional studio environment. How many of us are here? Eighty... thousand? It means that most people make records without the luxury of having a large console, a window separating the musicians and the engineer It's a different way of doing things... a rather complicated one. There are some things to deal with, but also a state of mind to adopt. And I'm going to try and share some new ideas, maybe. We have a Pro Tools|HDX as a base. We use a Pro Tools 10 which is the latest version. Pro Tools|HDX is the new card. A card that does I/Os and also has real-time DSPs. We are using a 16-channel HD I/O Avid interface, We're going to use that for inputs and outputs, as our converter. So, a Pro Tools 10, one HDX and the HD I/O. For the monitoring section... What's "monitor" in French again? "Écoute". Thank you sir. we use a Dangerous Music Source, which controls the volume, for both the monitors and the headphones. It's a really useful little box if you want to listen to what's going on in Pro Tools and maybe what's going on in iTunes, to compare both. We'll cover that later on. We have a set of Focal Solo6 monitors. Why did I pick these? Because I know them. I've listened to those monitors so much, in fact, that the room fades away a little. All rooms cheat us, obviously. There is no such thing as a perfect room, especially in the setting we're in here. But as you work and monitor with a set of speakers, you create a kind of relationship with your monitor, so that you can listen to it virtually anywhere and you know more or less what's going on. The key word here is "more or less". Meaning you can also get it completely wrong. Let's see, it's quite funny. So we have the Pro Tools 10, the HDX, the HD I/O, the Dangerous Source, And the Focal monitors to work with. Regarding preamps, we have a whole array: we're going to use some TubeTech, the new Europa preamp by Dave Hill, a Realios amp, and a Neve 1073. The preamps are plugged in right behind the interface. There's no compression, we simply work with preamps, and by moving the mics. I'm trying to get the best possible sound, in terms of clarity. And I work it out afterwards. As they say: "fix it in the mix". Of course, the idea is not to have to fix it in the mix. It's our job, while we still have a choice, to try and fix issues straight off. As for mics, I've got some Josephsons. There's a 715, a 716, a 700. Some 42s and some 22s. So the interesting thing here is that, until today, I mean until an hour and a half ago, I had never heard Josephson mics. I hadn't heard most of these preamps either. I knew the Europa, the MP1A. I know how it sounds, but I didn't know this particular one. While you were eating your canapés and drinking that wonderful punch, I played riddles. That's something I always do. There are many engineers, or producers, who always use the same system. and there's my bass drum." Truth is, these days: 1) It's impossible to do that, because not everybody has this kind of gear at home. I mean I don't have it... Do you? 2) You ruin your chances to ever get better since you always use the same stuff. 3) It's very likely that a D 112 on this bass drum, is the worst possible choice. Consequently, what I use for that is... my gut feeling. Meaning that I screw up on a regular basis. So the first thing we're gonna do is ask Mr. Will Knox, to come and sit here. How did I pick the mics for Will? Let me tell you. I'm not too sure how I did it. I asked the manufacturer, I said: "What kind of mic is this one?" He said: "That's a CK-12 capsule". since you've got to start somewhere, and you don't know these mics, let's start with that." The first thing I'm gonna do, is set up the vocals mic on Will Where do I put it? I don't know, maybe near the mouth Sounds about right. There it is... The science behind mic setups. The problem, of course, is that here, it's going to be a nightmare in terms of mic bleeds. So, we're gonna try it first, before Thomas starts to play, let's see if we can have a sound we like. I have a Josephson 716. Will has this incredible talent, he's able to play guitar and sing at the same time, and make it sound good all the same. Impressive, isn't it? And so, I'm going to add a guitar mic as well. Done. So we're gonna try and see what happens. Randomly, yes, but actually, I know that, for instance, if you have a small-diaphragm condenser mic, the mic bleed usually sounds pretty good. While with a large-diaphragm condenser mic, the sound of the mic bleed is less good. If I appreciate the distance and the way these two instruments project sound, that is, the guitar projects loudly and the voice projects a little less loudly, I know that I'll place the vocals mic closer and the guitar mic a little further away to get a bit of room. And I also know that if this mic is a little further away, there will be more bleed. If there is more bleed, I'd rather it was nicer, more in phase with the rest of the instruments, so that -- tomorrow during the mix -- I wouldn't have to do my drums sound and have my guitar track ruin the drums sound, because it was out of phase or the bleed wasn't nice. Do we agree? The idea behind this kind of exercise is that actually, everything has to bleed well into everything else. When I turn the mic up for each instrument the bleed of the other instruments that is not targeted by the mic should also be rather... good. Let's not be too ambitious... But at least, not unpleasant. It's not an easy thing to do. Let's see if we can do it. For guitars, after many an experiment... Especially with this guitar, that I know very well it's a great guitar for picking, a Collins. It's a great one, I recorded it many times because Will and I work together a lot. So we're gonna try to meet halfway. So here I'm gonna try to use some positive psychology to convince Will to watch the distance to his mics. In a setup like this one where everything is close, if we move the mic by this much, it can offset the phase and ruin it for everybody. Behind those two mics, there are two Europa preamps by Dave Hill, two preamps that just came out, very modern, very clean. The reason why I picked them is that, obviously, it's his record. So I want his voice to be as clear and manageable as can be. So I don't want to add too much coloration from the start, I'm gonna try to keep it as neutral as possible and as clean as possible. I've already used this preamp at home and it's super clean. I thought it would be a good idea, so that I don't get any coloration in the low end. It's not gonna mess up the rest. So we're gonna start with a short gain test. To be sure to avoid saturation. I'm adjusting the mic here because as you can see he naturally tends to -- as soon as he gets into his music -- his neck stretched over this way, he turned a bit over that way, he went down a bit, slumped a bit. So I'm adjusting the mic straight away, because it's now or never. Why now? Because if you start doing several takes and you adjust in between them, and you want to do some editing afterwards you're dead. So you really have to make decisions straight away. Not bad, right? And you don't hear much of the guitar. We were expecting worse, right? You have to trust it! Be positive! I just asked him to adjust the gain of the vocal, so we can have both faders at 0, and with that, a good balance. Well, we're going to mix it tomorrow, But imagine it takes place in 6 months' time. Or that I'm not the one doing it, that I send it out to a good guy: Chris Lord-Alge. If you don't hear the vocal, because it's -15 dB below, the first impression is awful. When I am sent songs to mix, and I receive loads of them, in general, I open the session, I don't even know where the vocal is. And on top of that, you can't hear it, you don't get the song, and you spend 5 hours sorting through it. An absolute nightmare. So, out of respect, for everyone who's working on the project, I always try to make it so that with the faders at 0, we have a normal balance. It always annoys me, when I listen to a session for the first time, that it sounds good and I'm getting to the chorus, and I get decapitated by the electric guitars. It's a nightmare. So, because I don't like it when it happens to me, I try not to do it to others. So, Ben adjusted his gains. It's absolutely normal to have shivers down your spine when Will is singing. It's normal. Get used to it, it's gonna be like that all night. I'm going to put it a bit closer. Just because that's how it's done. We'll take it as a success. And we're going to carry on a bit further. Simon is feeling good. This is a rough translation. It's considered a good custom to ask musicians to play their instruments a bit for you before you place the mic. First of all because it gives them the impression that you know what you're doing. But it also allows you to listen and figure out where the sound is coming from And it's also a good custom to ask musicians to play something that's part of the actual song you're going to record. So there's no issue here. We're gonna put it... here. What's the preamp? It's a Neve 1073, With a Josephson 715. Can we hear it again? That's not what I heard. Not great... Ok, let's try something else. We're gonna move it a bit further, to see if we can get more "air". It's better. Actually we put the mic too close. He's still feeling good! So now we're gonna go "boom boom". So many instruments for one musician! Same again. two heads, I thought that would be good, it's gonna go boom! I like things that go boom. Can you go boom for me? I thought, well, So I picked a mic. I want to be able to isolate the boom, so I can get a super boom. and so I picked a small one, a C42, because it's a cardioid, which is gonna allow me to put the bass drum forward without ruining the rest of the instruments. So let's do that! I also have two small 22s. These ones, they're very pretty, they look like lollipops. Can you play it please? Great! It's really something ambient, a bit like Tom Waits. And what I'm interested in here, is the boom, some detail on the snare drum and to isolate the cymbal a little to use it to create some kind of energy, when he uses it. But... not necessarily! In all the records we listen to, I try to listen to as much music as I can. I was listening to Al Green yesterday, which has one of my favorite drum sounds. And, the snare drum sounds like it's over 3 feet long that's how thick it sounds and how big the boom is. And they did it with one mic! There's ONE mic, and they placed it on the snare: boom. Then they got heaps more gear, because they earned money, and they put TWO mics on the drum kit. One on the snare, and one on the bass drum. I never really believed in them. Will is going to sing over here, and Simon's going to play over there. So if I put the mics here, I'm gonna end up with lots of Will in the drum track, And I don't really want to deal with that tomorrow. So I'm gonna try to find a spot where I manage to have a good balance of everything... with a bit of stereo as well, because you have to keep the future in mind. You have to invest in the future. The future for me is that, tomorrow, I'm gonna have to mix everything which has been recorded like this. There's a strong chance I'm gonna put him in the middle. We have Will, playing guitar. I'll most likely put him in the middle too. Meaning that, for now, I have a mono record. Sounds a bit retro. So, where am I gonna get my stereo info from? You gotta think about it beforehand. So I'm gonna be able to put a bit of reverb... Maybe... We'll see. But I also need to put some stuff on the sides. So I thought that maybe, if I did a bit of stereo, -- a bit on the sides -- that would help me tomorrow, when I'm all alone with my speakers, thinking what on earth am I gonna put left and right? I might put the cello a bit... a bit around the sides, but I can't do like the Beatles either, put it all the way to the left, it's a bit Mickey Mouse. I have to be careful with my stereo. When I place my mics, I often think about the final image of the mix. guitar and voice will clearly be in the middle, no point in doing it otherwise. As for the rest, it's all up for grabs. So let's hear it. On the bass drum, we have the Realios, and on the overheads, -- the two mics at the top here -- there's a pair of TubeTechs. The Realios is a transformer, a cascade transformer, And TubeTech is a series of transformer, tube, transformer. We're gonna have loads of fun with that. So the snare is a bit to the right. I like that. I'm gonna keep it there actually. And... don't you find the sound really warm? Pleasant, right? Yeah... I like it. I think it's time to check the phase relationshipbetween the two overheads and the bass drum mic. Ben is gonna do that with a plug-in. As the plug-ins are delay-compensated, he can have a plug-in running as he records, in real-time. and he could flip the phase. So here, we have a choice. Either, we apply a plug-in onto it, and we listen to it via the plug-in, in real-time. Or, we go to the root of the issue, that is, that we flip the phase of the bass drum. It's very important, -- extremely important -- to check the polarity and the phase as well. It's not always a problem. It can be good like that as well. But you have to watch out for these kinds of things, especially with drums. Because once you start moving something... it's a mess. "Mess" being a technical term, obviously. I like that. Sounds nice, right? Interesting. I like those mics, I never heard them before. So what we're gonna do now, is that we're gonna ask everyone to play together and see what happens when everything bleeds into everything else. 'Cause that's where the fun really is. I'm asking them to do the third verse, in order not to wear them out and not to waste time. Which is something you should always do when recording: watch out for your musicians' energy levels. But if we were in an actual session, it takes a while to manage all those mics, to flip the phase and so on. There are lots of musicians who are not used to doing the take three times because you have to flip the phase of the bass drum. They don't care. But it has to be done now, because fixing it in the mix is a nightmare. So I communicate a lot with the musicians, it's just as important as placing the mics. Communicate with the musicians and explain to them why you're wasting their time! So I'm always very straightforward about that. I tell them it's gonna take a while to get going, but then it's gonna be great. Isn't it just a great song? That's where the fun begins. The interesting bit here is that we're switching to strumming. It doesn't sound great at all. So, the mic is great for picking, very sweet. But not so great for strumming! What do we do? I wonder... let's think about it. It's nice, but there's quite a few pops. That's because he eats the microphone. But if he doesn't, I get more drums than vocals. So I'm gonna have to deal with it, there's no way out. I had asked him to think about his distance to the mic and he forgot in the end, because he was into the song. But we're going to remind him before each take that it would be nice if he could keep us in his heart and not sing full blast into the mic, this close to the capsule. Thank you sir! I'd like to hear the bleed of the other instruments into the drums, to see if it's gonna be a mess or not. That technical term again. I'll have less reverb on the guitar. We can hear the cello a bit. Not that bad! I'll survive. Well, that one is crap. if my theory proves me right tonight, the drums bleeding should be less irritating in this one. Let's try it! That's when Ben starts getting a headache, because I'm taking the drums' mic and putting it on the cello. But Ben is much stronger than that. He doesn't care, nothing can stop him. Let's see if it works. Because that one was really bad, right? Goes to show that sometimes, intuition doesn't work. There's an important feature in Pro Tools for tracking, that is, recording musicians live. As far as I'm concerned, I'd rather work in Pro Tools, for the following reason: That's what we just did. The playlist system is actually a system of different layers. That is, the oldest are at the back, and the newest at the front. It's really incredible how it changes your life, in terms of practicability and organization in your sessions. When you're tracking vocal, for instance, I can get up to 60 takes. but a normal singer, who can't sing, it can take up to 60 takes. The great thing about Pro Tools, is that regarding takes, when you have 60 takes, you press the button, it lines up all your tracks like that, it's well organized, easy to modify, and easy to create a new playlist. They added a shortcut, Ctrl+\, and to duplicate, it's Ctrl+Cmd+\ It's incredibly fast. no new track to create... It's just a playlist. If you haven't used Pro Tools yet and want to make music with live musicians, it's important to look at this feature. I know that a lot of people don't use it. To do the editing between the takes, it's a nightmare to work like that. You have to work in layers, like so. That's something I really miss in other software. Many people who come from other software, try Pro Tools and don't see this feature and miss out on a gold mine in terms of system optimization. So, Ben created a new playlist. Let's hear the difference between the two mics. Let's see if we got better, or worse or if we're even. Let's not wear ourselves out. Either we have a sharper cello, more isolated, easier to manage. Or we have a drum sound that goes from bad... to really depressing. I think that what we should do is add a mic on the guitar, to be safe, just in case, for the part where he's playing quite loud. In that kind of scenario, I tend to use a ribbon mic These are mics that don't have much treble, that are very soft, and also tend to compress transients a little. It's a "smooth" mic. So I think that if I have that, as security, I may find a sound in between. So, I have a ribbon mic. It's always good to have a small ribbon mic, even though this one is rather great for fingerstyle. It doesn't need to be expensive, it just needs to be there. This one is an AEA. I often have a Royer, or AEA, things like that, in case I get into this kind of trouble... which happens regularly. Let's listen to the ribbon only for now. It's nice, but it lacks character I've got the low end that I didn't have on the other one. Let's check the phase between them both. It doesn't have the same low end, but it's very pretty, very ethereal. The ribbon is gonna come in handy tomorrow during the mix. when it starts to go gling gling.. I'm not sure yet. We'll see. I'm asking him to record it, but not to listen to it. Otherwise it's too much of a mess. That was really awful, so we're gonna scrap it. Thanks for coming, thank you. What do we have left? We have this one left, so let's use it. Let's pray that it's gonna be good. Or else, it's not gonna be good, again. I'd like to draw your attention to the levels Ben is using. He doesn't record very loud. Don't you find that it's a bit light? Actually, no, that's where you should be for tracking. For several reasons: 1) The louder you record, the bigger the chances you'll overload the input stage. And there's no "Undo" button for that, so it's better to leave plenty room for that. 2) 99.999999% of the sessions I receive for mixing are recorded so loud, everything is recorded so loud, that I spend most of my mixing time fixing those problems. I start off by lowering everything by 6 or 12 dB, just so I can listen to the song, without hurting my eyes. So, if you record everything very loud, the first thing that happens is that you kill all transients and if you do that, there's no music anymore. Because music is all about transients. And on top of that, there's something that builds up, over time there's a spot you reach where all your machines start to sing. And when everything is aligned, it sounds just great. Let's listen to the difference with everyone's bleeding into the new cello mic. My eyes don't hurt anymore. but now I know that the drums' bleed in the cello's mic is not going to ruin my life tomorrow. but the cello sounds much better like this, right? And the drums' bleed sounds much better. So, we started out with that mic there. Speaking of which... how does the bass drum sound? Because the cello's mic is now on the bass drum... let's not forget! Nice. It's acceptable, it has potential. because all of the shhh, tsss ... That's gonna be bad for my health tomorrow. So let's try, there's no harm in trying. This exercise is meant to show you that we expect certain things and that our reasoning is based on 1) How much the mic cost us. 2) What we read on Gearslutz. 3) What the mic looks like... Essential. These 3 parameters, you'll have to admit, are totally irrelevant for an audio recording. The idea, actually, is to remain curious, and to try things out. Because initially, and especially when you have musicians of this caliber who are... I don't know if you noticed, but 1) They don't joke around. 2) They're patient, because they know that at the end of the day it's going to help them make a better record. And we have to put ourselves in a situation, as engineers and producers, where we have the choice and the opportunity to do that. that we're never happy with and before you play the song to your friends, you start making excuses... "Yeah it's not mixed..." "It's not masterized..." "Ehm, you know, the bass drum... we actually borrowed it..." No! Let's try to elevate the debate and do it so that we can press play without having to read out the Declaration of Independence before we play the tunes we recorded yesterday. and the third time round, you don't know what you're doing anymore. That's normal. But at least we tried. I found that on his vocals, this mic didn't work out well. So, let's change it! Let's try this. Listen to the shhh and sss. We're gonna play the previous playlist and compare both mics. We're facing a choice here. But I can fix it easily. For the big shSss, it would take me hours to fix that with a de-esser. Because I hate it when we can hear that I'm doing something to the music, and compressing etc ... I find it awful, especially for this kind of music. It's not dubstep! So I think that it's a big change, especially if Will is careful not to do the Stevie Wonder thing. For rhythm purposes, and so that everyone plays together, I'd like to send a cue mix to Thomas's headphones. And so, we selected all the tracks and we're going to insert the physical output 15-16 on one of Pro Tools' outputs. You'll notice that it created an Aux on all tracks. We're now going to copy the mix we have at the bottom and we're going to send it to him. His headphones are plugged into output 15-16. In Pro Tools, you can select all tracks, and do "Automation", "Copy to Send". There we go, the mix is entirely copied directly onto the Aux. We're gonna put it in pre, so we can carry on doing our own mix. We're gonna do a Master on output 15-16, in order to change the sound and give Thomas the volume he wants. So, we are using an AAX plug-in, since it's a new HDX system The good thing about it is that we can use it in real-time. Why am I putting a high pass? Because as a general rule, when drummers have their headphones on, if the bass drum comes back into their headphones out of phase, They will hit it too hard since they hear themselves less. If we put a high pass on the cue mix, it's not as big an issue anymore. They hear the bass drum in real-time and play rather well. We're going to add a limiter as well. So he won't split his ears if he hits hard. The great thing about working with plug-ins in real-time, is that we have mics going into the interface, we go through Pro Tools, through the Send, through the Master, through the plug-in we come out through the interface, into the amp, into his headphone -- all in real-time. No latency! It's really convenient. I can't quite imagine working without that. Let's face it. Unless you have a huge console. But I didn't get one this time. That's one of the greatest things about working with a system with onboard DSPs such as the new Pro Tools. Is it ok? Before we record the song, do you have any questions? Yes, sir? The question is: I swapped the bass drum and the cello, I had a small-diaphragm condenser mic on the bass drum, which we liked, but the 715, that I thought was gonna be good on the cello turned out to be nonsense. So I took the 715, I stuck it onto the bass drum, and put a C700 on the cello. So the C42 ended up punished, in time-out. I took the 715, put it on the voice which is a bit darker -- but that's a good thing for us. I put the 716 on the bass drum and it sounded great. Any other question? Great question! Why didn't I put the small mic back on the bass drum, as it would give me more options? Because I don't want more options. I'm tired of having lots of options. When I receive a track with 27 drum mics, I use 4 of them... Just for the sake of it -- in protest. But I could feel a big problem coming on. And we don't have half an hour, we're making a song. so we can do another one the next day, and another one the day after. The more songs we do, the better we feel. Spending a week on the snare sound, as they did in the 80's, ...there are many things they used to do in the 80's that I'd love to do, but that's not one of them! The angle I use for the mics? Does it point to where the sound is the loudest or the most pleasant? Does it disturb the musician? Am I doing something good enough to control the mics' bleeds? It's a mix of all 3! Cardioid mics are convenient, because there's plenty of rejection behind them. Regarding the vocal... if we only did vocals without him playing the guitar, I'd probably put it a little further away and I may put it at an angle to prevent him from singing directly into the capsule, to avoid pops and esses. But if I do that, I'm gonna get even more bleed from the drums. It will be impossible to mix tomorrow. Let's record this beautiful song from start to finish because I'm tired of hearing the same verse over and over. Will Knox! See you tomorrow at 3pm for the mix! Would it make sense to put some fat acoustic absorbing panels between the players, to rid of the bleed ? Could we get English subtitles for this video? Thanks. fantastic! Huge props to the band for nailing every take. In theory the windscreen was built in the microphone so I did not bring one. Live and learn. Really entertaining to watch this one! Was a bit wondering why Fab don't uses a Windscreen to get rid of the annoying Pop-Sounds in the Vocal track? Greetings from germany! @Electric Eye Yes, look at the bottom of the player. You can engage the English subtitles. Is this available in an English version? FREAKING GENIUS!!! I wanna be like FAB when I grow up!